With access to 80% of house-building sites across the UK, NHBC regularly hosts site visits for elected representatives in constituencies around the UK. 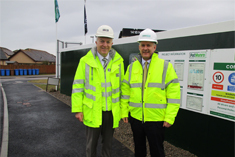 "It was an enormous pleasure to visit Pat Munro Homes in Alness, along with NHBC and learn of their partnership working. It strikes me that NHBC has an extremely important role to play in housing in Scotland, ensuring quality standards and supporting customer satisfaction." Read about our previous site visits and other NHBC news.